Today is Cinco de Mayo, and we’re going to help you get the party started with a review of an excellent tequila. 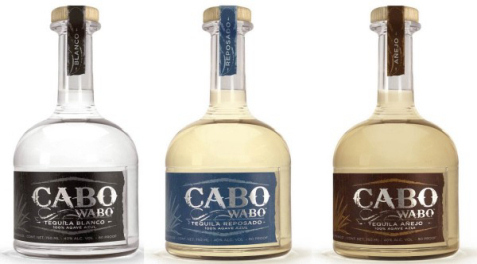 The Cabo Wabo brand of tequila was created by The Red Rocker, Sammy Haggar, who also owns a night club with the same name in Cabo San Lucas, Baja, Mexico. This premium tequila is the genuine article – 100% Weber Blue Agave. The folks at Cabo Wabo were kind enough to send us bottles of all three varieties you see above, and we definitely had some fun giving them a try. The bottles have recently been redesigned, and as you can see they’ll look great in your bar or drink cart. You can read more about the different kinds of tequila here, but the difference in the types of tequilas come from the amount of time they are aged from the time of distillation to the time they are bottled. The Blanco (or Silver) is bottled right away, while the Reposado and Añejo are aged longer which give them more color and more complex flavors. I liked the Blanco the best, but all three varieties were great. If you’re only experience with tequila involves cheap shots at the bar, you’ll be shocked when you try a premium tequila like Cabo Wabo. The tequila is delicious and can be sipped like other high end spirits. Of course, you can also shoot it and use it for great mixed drinks, so when you’re enjoying Cinco de Mayo today, order up some good tequila like Cabo Wabo and impress your lady friend!